Just this past month Canadiandollarbingo players have taken home a daily average of $180,000 in cash prizes from the bingo rooms. In addition to the progressive bingo jackpots, there are also other regular exciting games such as the nightly $1000 Coverall (every night at 11 pm) and the $100,000 Main Promotion Room. Last month we got to see RED4Xmas claim $22,855.00, and cloud9 took $19,867.12 in winnings while playing their favorite slot games. This is one of the many massive wins we get to see throughout the month on any of the exciting bingo games, and slots with huge PJPs. Look out for slot games such as Makin' Bacon, Three Time the Riches, and Trolling for Treasures as these are making record high jackpots. 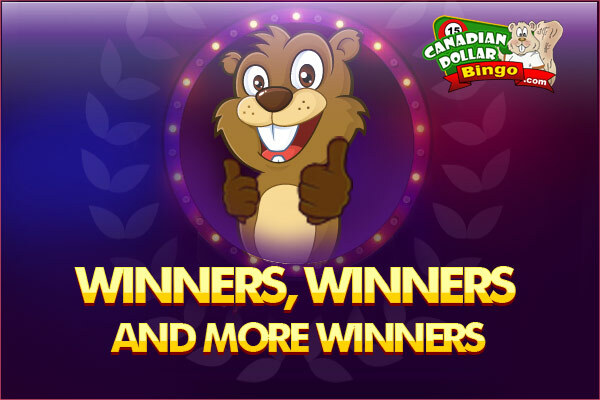 Canadiandollarbingo has a huge selection of slots and mini games – Over 50 popular games to choose from. Players can also play slots for free using the ‘Play for FREE' feature under the games Tab. Canadiandollarbingo is always thinking of new ways to make players feel happy and improve their player experience. Playing bingo for just 1c is just the latest addition to the long line of treats - so, grab those bonuses and find out for yourself now. See you in the bingo rooms!